93/100 is one of my all-time favourite chiffons, in my all-time favourite #ShadesOfBlue, SKY-BLUE! Of late I am in a world of too much Fusion in my life; fusion food, fusion band, fusion song, fusion wear fusion style etc. 93/100 #100sareepact is an attempt to my first FUSION Drape! Chiffons are evergreen in nature. While writing saree stories did a close study and found chiffons were quite popular in the era of 60ss and 70s in India! Bollywood heroines were looking gorgeous in those body hugging drapes. Parallely a young group of English guys were running and creating a magic worldwide through their music. They became widely regarded as the foremost and most influential act of the rock era. Yes my friends I am talking about The Beatles, the English rock band, formed in Liverpool in 1960. Rooted in skiffle, beat, and 1950s rock and roll, the Beatles later experimented with several genres, ranging from pop ballads and Indian music to psychedelia and hard rock, often incorporating classical elements in innovative ways. While draping my sky-blue chiffon, I thought of a Fusion angle and doing a crazy innovation. I draped the saree pairing it with a long sleeves designer top. The design is an uncommon print with theme ‘The Beatles’! The chiffon top is unique, colourful and those images echo the musical era of Western part during 60s and 70s. 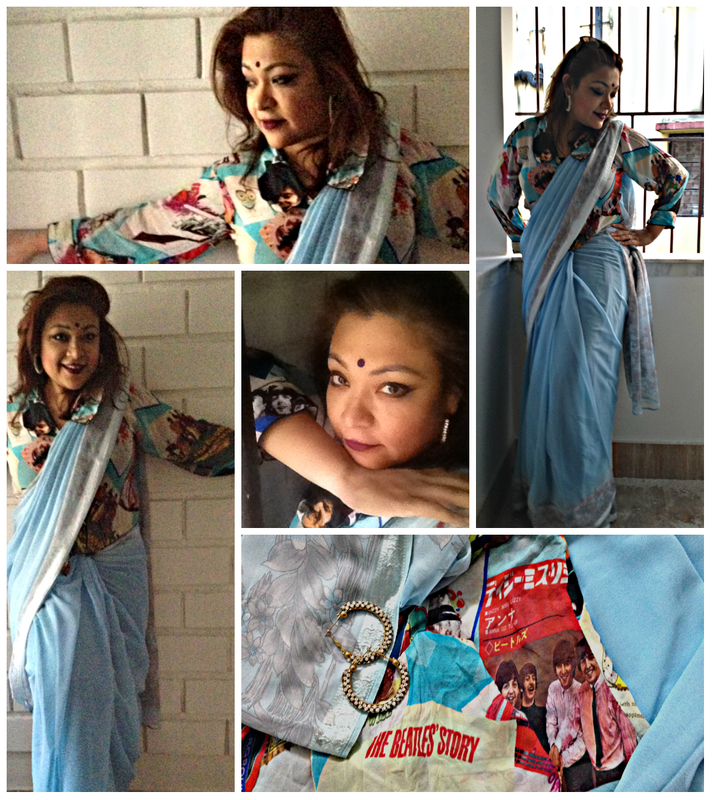 The Saree and The Beatles- this wonderful concoction was my FUSION FASHION with 94/100 saree. 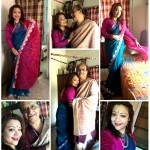 Let it Be, a saree tale which takes us in the nostalgic lane of 1960s -70s….